Who will win in the 2nd round of elections and will be the new President of Ukraine? 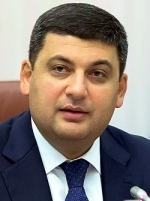 Prime Minister of Ukraine Volodymyr Groysman considers it necessary to introduce amendments to the Constitution for defining the powers and responsibilities of local self-government - Ukrinform. "We propose to enshrine the main directions: the formation of the three-tier administrative-territorial system: community - district - region. The development of the effective system of local self-government should be the main direction. The financial basis of local self-government should be ensured. The next basic direction is the formation of the institute of prefect, i.e., the state supervision and control," Groysman said at a round table discussion devoted to the reform of the local self-government bodies, an Ukrinform correspondent reports. The Prime Minister noted that the key priority was the creation of comprehensive executive committees of the district and regional councils. "The decentralization reform has always been and remains to be crucial for me. We must to enshrine its irreversibility in the Constitution. There have been many attempts to stop the reform. Therefore, we will define clear steps to remove ambiguity and protect the reform," the Head of Government stressed.